Arsenal - an architectural monument of the 16th century (Pidvalna St., 5). This is one of the few buildings of defense type, which remained till nowadays. 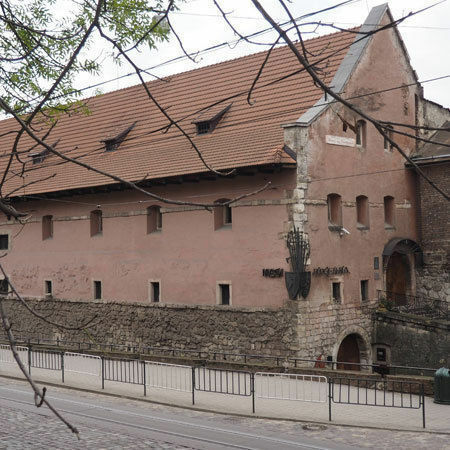 On this place in 1430 there already was a small armory, which was disassembled in 1554, and on its place under the direction of master Ivan Lys in 1555-1556 there was built a new one, almost completely destroyed by the fire in 1571. The building, which survived until nowadays was built in 1574-1575 with Lviv architects Pavlo (Pavlo Shchaslyvy?) Hanusch, Sebastian (Sebastian Mochyhemba?). Since the construction was carried out due to city funds, the building got the name City Arsenal.Arsenal was a part of Lviv fortifications system. Its eastern side is attached to the High defensive wall between two towers - Tokarska and Povoroznytska from the north and Shevska tower from the south. In front of the building was Bastille. All together this created a powerful defense of the city. In Arsenal they kept and repaired weapons. Along with Arsenal there was the ammunition. Since 1582 near Arsenal (from the side of Braty Rohatyntsi St.) there was a guns foundry, which were cast for the defense of the city and for sale.